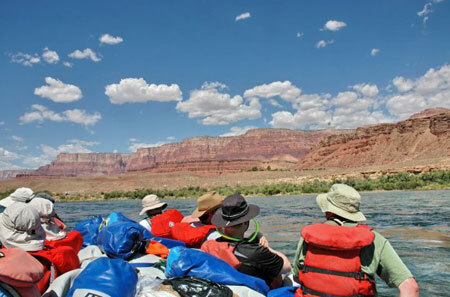 “Let’s Go Boatin'” still rings in my ear; and I can still vividly remember the first time I heard Tom Vail’s call when we launched our trip from Lee’s Ferry in the Marble Canyon on June 23rd (pictured above, the Vermilion Cliffs are in front of us). Though it has been over a week since I have returned from our 8-day/7-night white water rafting trip on Colorado River, Tom’s typical call to get on the boats is permanently etched in my mind. In a rough analogous way to Pavlov’s dog, Tom’s call moved us to “salivate” for boarding our boats to begin another informative aspect of our white water rafting trip down 187 miles of the Colorado River, starting at Lee’s Ferry in Marble Canyon and concluding at Whitmore Wash in the Grand Canyon. Canyon Ministries in cooperation with Answers in Genesis, through the gracious gifts of donors, gave scholarship to 23 College and Seminary professors. Since the aim of this trip was to influence professors, it was described as the “2008 Grand Canyon Christian Scholars’ Trip.” More specifically, the purpose of the trip was to influence College and Seminary professors, who seemingly had more post-graduate degrees than Carter has liver pills, that the geological evidence in the Grand Canyon is best explained as a result of the universal flood in Noah’s lifetime. 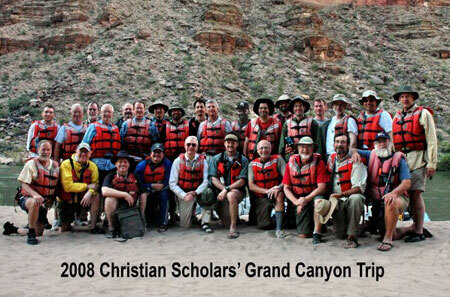 Besides the 23 professors, 5 additional scholars came on the trip to provide biblical and geological discussions. The following is a picture of our august body after the trip. 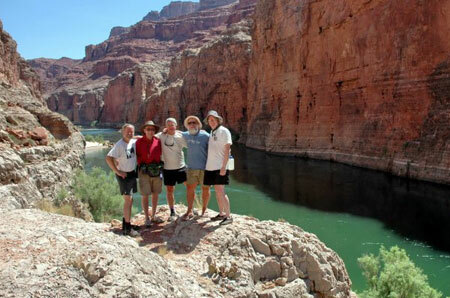 The following picture is of the team of five instructors who gave us a biblical and geological education on this trip. Pictured from left to right are David Coppedge (NASA’s team lead system administrator for the Cassini-Huygens mission to Saturn at the Jet Propulsion Laboratory in Pasadena), Bill Barrick (Old Testament Professor at The Master’s Seminary), Andrew Snelling (Geologist par excellence, Director of Research with AIG-US), Tom Vail (director of Canyon Ministries; my impression from some river rafters is that Tom is something of a legend among river rafter), and Terry Mortenson (lecturer & researcher with AIG). All of these men are experts in their fields. The expertise that these five men brought to the trip was invaluable. Since “let’s go boatin'” is permanently etched in my mind, I thought it appropriate to use this as a title for this post. 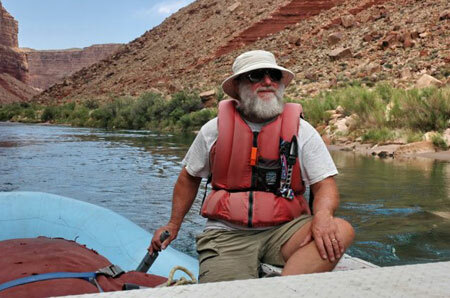 Here is a picture of Tom leading the way down the Colorado River. Though I cannot forget Tom giving candid directions laced with humor, articulating geological insight about the canyon on a raft, climbing the canyon like a seasoned mountain goat, testifying how God in his sovereign grace saved him, and instructing how Noah’s flood provides the best explanation for the rock formations in the Grand Canyon, what I remember most vividly is “Let’s Go Boatin'” (for some other blogs describing aspects of our trip, click here for Bill Barrick’s blog, here and here for Del Tackett’s). This is a trip that I will never forget.